"what the hell?" these were my exact words after reading the last page of Deadly Lovers. 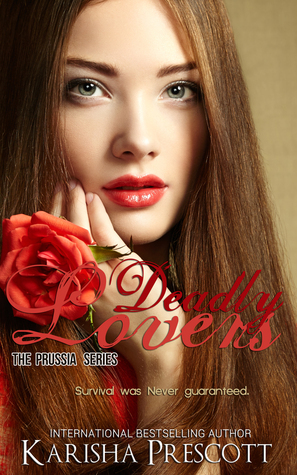 Perhaps, from all the Prussia stories I've read, Book 4 Deadly Lovers is my favorite because it is action packed and jaw-dropping and cliff-hanging. I couldn't help but as gasp as new events unfold, new characters appeared, new secrets are being revealed, a lot of blood spilled and even more throats got slashed in one sweeping motion. Lydia continued to mystify me with her compassionate gestures towards Prussia. The two feuding queens, Victoria and Patricia, had provided the side dish I crave for in a vampire story. Tommy, the only other human trapped in a castle full of vampires, was also my favorite. I wish I'd see and read more of him in the upcoming book (crossing my fingers for this!). I also have to mention Lydia, who had finally redeemed herself and earned my trust. Well, okay, I meant, Prussia & my trust.And Prussia, oh my gosh! Prussia transformed right before my eyes, from once innocent and cowardly human pet into a full-blown insane immortal vampire-human, the kind of character I expect to see from monster. A Vampyr!I really love how Karisha kept up the suspense all throughout the book. This one though is the biggest cliffhanger I have read in the series. I also notice that this book was told in first person, thus enable me to read all of Prussia's thoughts, desires and fears. Wonder why I haven't said anything about Sebastian from all the past reviews that I've written before? Well, I'm saving him for last. Because it seemed like Sebastian's future, fortune and misfortunes will finally be told on the last book in the series, Eternal Lovers. So you and I both just have to wait until I'm finished with the Prussia saga. I, yet again, find myself confused. I feel like the "love" in this love story is more than forced and often forgotten about because it just isn't there. I love a good cliffhanger, but throwing in something that had not had any foreshadowing feels like an attempt to keep disengaged readers hoping for something to make sense and buy the next book. I have said this in every one of my reviews for this series, I really want to like them, but the inconsistent plot doesn't really build. Everything is told, not shown, and I'm always left wanting more.